Underused commercial strips, industrial parks, and old shopping centers are lost opportunities for the region. Despite their sprawling appearance, many of these places house large numbers of people and jobs. If designed properly and supported by new land-use regulations and roadway-design standards, these places could be transformed into sustainable developments that support their surrounding communities. Elsewhere, underutilized commercial properties could become part of the region’s open-space system. The growing demand for walkable, urban living has left car-dependent communities behind. Vacancy rates are on the rise in suburban commercial strips, industrial parks, office parks, shopping centers, and institutional campuses. Demand is also falling for single-family homes in low-density communities. A number of national studies estimate the current supply of single-family homes will meet demand for decades to come, and that demand for walkable urban places in the New York Region is 150 percent higher than for auto-oriented suburban strips, retail centers, and commercial campuses. These underused or even abandoned car-dependent places are visual scars for their surrounding communities. They drag down the local economy and pose environmental challenges. But their revitalization into new, sustainable communities is often impeded by the difficulty of developing a vision and consensus among multiple municipalities, overcoming the regulations and practices that were designed to promote auto-oriented growth, and obtaining financing for infrastructure design and development. At least where I am, there's not any nice landscapes. Just buildings and roads and, that's it. Many of these areas are spread out and remote and therefore difficult to make into complete communities. 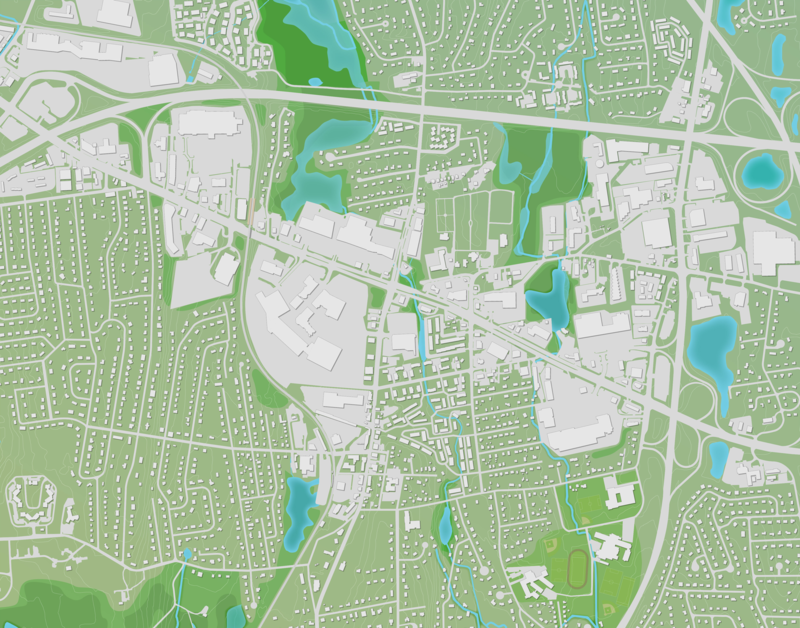 Yet some of them—those that already have concentrations of population and jobs nearby, as well as access to existing or new transit services—could be adapted for a new generation of suburban residents. Some of these places are corridors that are organized around major arterials. Others are sometimes called “edge cities,” loose agglomerations of stand-alone, auto-dependent developments that could be stitched together to make complete transit-enabled centers if new infill development and public spaces were properly configured. The capacity for new jobs and homes in these places is huge. Route 110, already home to 30 percent of all jobs in Suffolk County, could be redeveloped to easily accommodate close to another five million square feet of office space and almost one million square feet of industrial space. 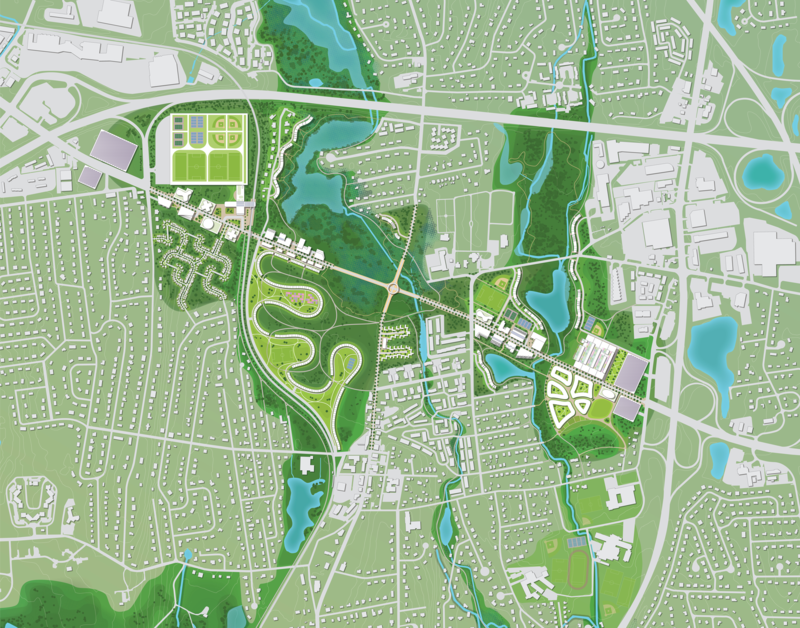 Nanuet in Rockland County, NY; Route 7 in Fairfield County, CT; and the Hoffman-LaRoche campus in Nutley, NJ, are all examples of places with large amounts of fallow or underutilized land that, with the right policy and planning actions, could be transformed into productive, community-oriented places. Many existing land-use regulations were written at a time when the goal was to promote large, single-purpose precincts. Using well-established models of best practice, zoning regulations should be updated to reduce parking requirements, allow shared parking, and promote increased use of walking, biking, shuttles, and on-demand services. Building-design guidelines should be written to create transitions in scale between new and proposed buildings, and between redevelopment areas and their surrounding neighborhoods. Finally, site-planning-design guidelines should require more street connectivity within large-development parcels and with surrounding areas, and organize buildings in ways that create public spaces and well-defined streets. States should encourage municipalities to update their land-use regulations by providing free audits and trainings; and applications for state and county grants should include these objectives in selection criteria. To implement this innovative transportation strategy, transit agencies will need to collaborate to implement an integrated payment system across the region, allowing customers to use a single card or smart-device application across all modes, including car-sharing and bike rentals. State transportation departments and regional transit agencies will all need to construct new infrastructure that includes convenient transfer points between modes. Turning auto-dependent landscapes into communities will require transforming the major roads around which they are organized. 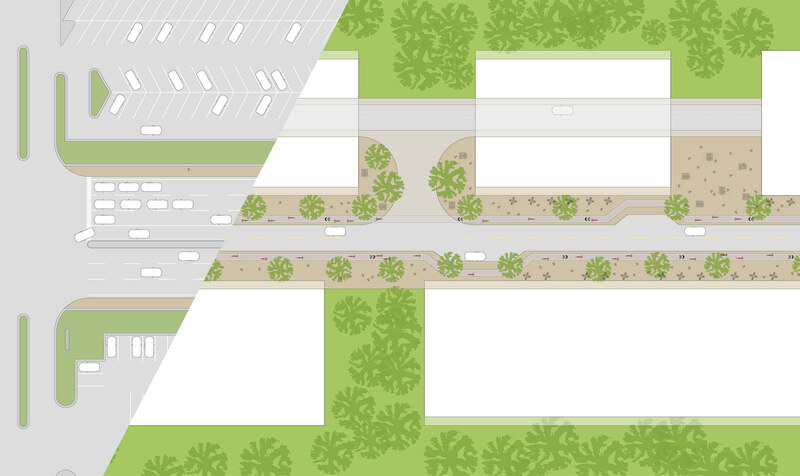 While departments of transportation have paid lip service to “context-sensitive design,” too little has been done to redesign roads to support the needs of the local community. Traffic planners should evaluate and prioritize a number of interventions, such as narrowing roads, reducing the required turning radii to slow down drivers as they turn, providing mountable curbs at intersections to reduce pedestrian crossing distances, decreasing lane widths to reduce vehicle speeds, creating well-designed bus stops and dedicate lanes to improve transit service, and requiring shared driveways to reduce the number of locations where vehicles interrupt pedestrian sidewalks. When commercial corridors pass through multiple jurisdictions, which is typically the case, states and counties should help establish and fund multijurisdictional partnerships to implement coordinated planning. One model is the I-35W Corridor Coalition in Minneapolis, which was established in 1996 as a civic organization through which individual municipalities along the corridor could share information, and identify and lobby for investments with shared benefits. 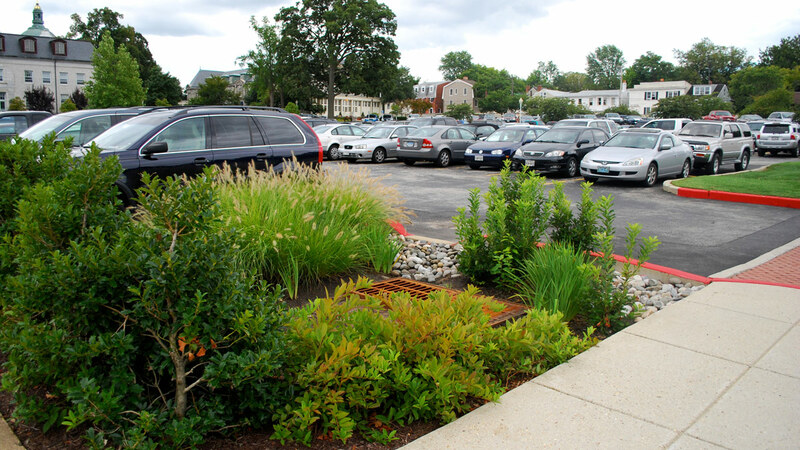 The large expanses of pavement that come with auto-dependent landscapes, such as roads and parking lots, generate heat in the summer, and polluted storm-water runoff when it rains. The redevelopment of these places into real communities is an opportunity to replace pavement with more natural landscaping. In the targeted edge cities and corridors alone, more than 13,000 acres of marginal, low-density land could be redeveloped into higher revenue-producing, compact mixed-use development. RPA’s experience with redesigning arterial corridors shows it is possible to double the amount of commercial development in selected sections to generate twice the tax revenue for the municipality. Overall, these targeted corridors and edge cities could add 100,000 jobs and 110,000 people. There are additional important positive outcomes that are more difficult to quantify. More families could live in higher performing school districts and closer to better paying jobs. As paved areas are reclaimed for green infrastructure, storm-water quality would increase, thereby decreasing the urban heat island effect. Moreover, these new places, with their own unique identities, could reinforce a sense of community. These proposals are less capital-intensive than process-intensive. The identified auto-dependent landscapes already have water and sewer services, as well as transit connections, but will require revisions to state and county roadway design and access standards and, even more importantly, revisions to local zoning codes and regulations. Municipalities can require that new development projects implement design improvements such as sidewalks, lighting, and green infrastructure elements. However, some capital investment will be required to build new transportation infrastructure and reconfigure a select number of roadway segments. An estimated 40 miles of corridor would cost approximately $400 million. This represents only a very small fraction of DOTs’ annual budgets and can be accomplished by prioritizing within existing budgets.